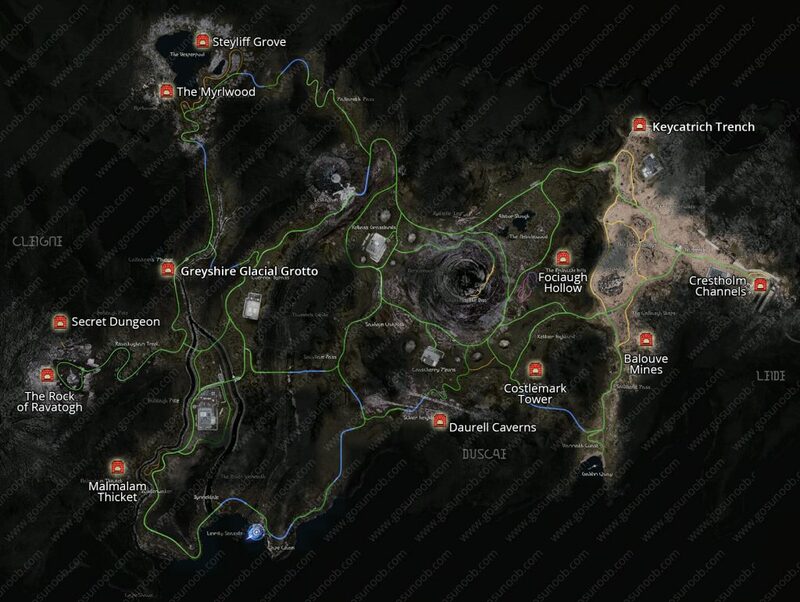 Final Fantasy XV Dungeons are located throughout the game and represent special areas with a lot of good loot and bosses. Some of them are part of the main story quests and are related to Royal tombs that Noctis and the company have to visit in order to collect the Armiger weapons. Others are optional and are there to challenge you or help you finish a side quest or get good gear. Dungeons are fan favorites and probably some of the best parts of the game. This guide will show the location of all dungeons in Final Fantasy XV, what types and levels of enemies can you expect to see in them and the most important information about the loot and unlocking mechanisms for each. We will also be providing detailed guides for each dungeon and you can find links to them in the list bellow. The important thing is to think of Final Fantasy XV dungeons as places you would encounter in any MMORPG or several RPG games out there. While roaming the open world you can come across an entrance marked with a red icon. You can enter right there and then and the dungeon is usually a labyrinth of sorts filled with narrow corridors. It is usually a guided experience with several alternate paths you can take to the end boss. Along the way you will be able to pick up higher grade loot and gear for Noctis and friends. These range from Phoenix down to accessories and weapons. Here’s a map of all dungeon entrances in the game. We concentrated on dungeons present in Leide, Duscae and Cleigne regions of the game. There are a few more dungeons later in the game, but you can’t miss them as they are part of the main story quest. Bellow you will find all the key information about each dungeon in the game. We list the recommended level based on the highest level mob in the dungeon. We’ll also note if there are special conditions you need to meet to be able to enter the dungeon. If we’ve written the guide for a particular place you’ll also find the link to it there, otherwise you’ll find notes about gear of significance found in the dungeon. Entrance: It is the first dungeon in the game and to enter it you will have to do the main quest during Chapter Two. It contains a Royal Tomb and your first Armiger weapon. Boss: Level 12 Arachne. Vulnerable to Greatsword, Machinery and Fire spells. Entrance: Another dungeon you get taken to as part of the main quest. You’ll be sent here to look for an Armiger after you first visit Lestallum. Entrance: Part of the main quest “The Trial of Ramuh” in Chapter 5. There is a rock before that quest that you can’t go through. Boss: Level 30 Naga – She can turn you into a toad so make sure you bring potions against that. Entrance: When you drive during the main quest “All Set to Set Sail” in Chapter 6 your buddies will recommend you check this dungeon out. Reward: Armiger Weapon is at the end. Entrance: Rock of Ravatogh side quest takes you here and the reward is Armiger weapon – Mace of the Fierce. It is also part of the side quest Vyv’s Volcanic Inspiration This used to be a cave that Noctis could visit in the Duscae Demo. In the final version of the game this is a dungeon with Royal Tomb in the end. Mobs: Level 25 Saphyrtail, Spiracorn, lvl 28 Killer Wasp, lvl 29 Thunderoc, Lvl 38 Wyvern Note: You can go through the whole dungeon without fighting the boss and picking up all the loot, including the Armiger, at around level 30. Entrance: You will have a chance to enter this dungeon as part of the main quest Party of Three. Notes: It has several floors you can access via the elevator or hidden passages/stairs. Boss is on the 3rd floor down. This is Royal Tomb location. Entrance: You will have to follow the main story up until Chapter 7 to enter the part of the map containing this dungeon. Reward: Moogle charm accessory is found on the ground fairly early. It increases EXP earned from battles. Entrance: You can enter this dungeon at any time. Notes: It has several floors you can access via the elevator or hidden passages/stairs. Boss is on the 3rd floor down. This is Royal Tomb location. Mobs: Level 7 goblin Boss: Level 52 Aramusha. Notes: Yojimbo and Bussemand come together. Do lightning to dispose of Bussemand quickly then fight the samurai Boss: Level 50 Jormungand – bring fire resistance. Drops Drooping Whiskers. Reward: When you kill the lvl 38 Black Flan you can pick up the Auto-changer accessory. This changes Noctis’ weapon after each attack. Cindy sends you here as part of her side quest to get Enhanced Headlights. These will drive away daemons when you drive at night! Entrance: You can enter this dungeon only at night. Dino sends you on a side quest Treasure beyond measure here. Entrance: You can only access Pitioss dungeon by using Regalia Type F flying car. What follows are spoiler so be warned. You get the flying car right before the last mission in the game. You will have to go back to explore the previous lands instead of going after the last boss. With flying regalia go to the volcano and look for a small section of road (yellow line on the volcano’s mini map). You can land there if you time it perfectly. After landing follow the path up to the building. Only Noctis can enter it. There are no enemies and it is filled with spatial puzzles. If you need help getting there, check out our guide on How to reach secret dungeon with Regalia Type-F. Many of the dungeons contain mysterious locked doors near the end point. They’re all the same, which probably means they have the same origin. The key to unlock them is obtainable at the later stages of the game. If you’re interested in opening them, take a look at our FFXV dungeon locked door guide. I didn’t get the quest by finishing the game…there must be other requirements, too! you can enter the dungeon without getting a quest by following this guide. Did you even proof check anything. You can access Keycatrich Trench, Balouve Mines and Cresstholm Channels in chapter 1, complete* them before taking the last quest of chapter 2. Then after at the end of chapter 2 you can access and complete Greyshire Glacial Grotto, Malmalam Thicket, The Rock of Ravatogh, Daurel Caverns, Costlemark Tower. Then in chapter 5 you can access Fociaugh Hollow. In chapter 7 you can access Steyliff Grove and The Myrlwood. And finally in chapter 15 you can access Regis Secret Pitioss Dungeon if you got the flying Regalia. *By complete I mean get the raiments, not complete the post game dungeons. Can anyone tell me what/when will the dungeon open at the top of the cliff at Southend pass? Where you first see the giant bird and pick up the garnett I believe. At the end of the cliff you hear dungeon music and there’s a hole in the rock. Much appreciated!